Ovarian cancer is the cancer that forms in the ovaries. There are two ovaries in a woman's body which is found on each side of the uterus. These almond sized ovaries produce eggs as well as the hormones estrogen and progesterone. This cancer is most difficult to be treated as usually it is hard to detect until it is spread within the abdomen. The post here gives a brief introduction of symptoms, stages, types and ovarian cancer diet. The cause of any cancer is the genetic mutation of the cells, which means DNA of the cells get damaged and results into the abnormality. These damaged cells are called the cancerous cells. These cancerous cells grow abnormally and start replacing the normal cells also. The cause of this genetic mutation is still unclear. There are no early symptoms of this cancer. Usually it get detects at a late stages when the cancer has spread through the ovary to the other surrounding parts. The actual causes are unknown for the cancer; however, there are some risk factors that affect probability of getting the cancer. There are almost 30 types of the ovarian cancer based on the cells it starts from. These cells are then classified into three common categories from where the cancerous ovarian tumor can start. The ovarian cancer stages have been categorized into four different levels from stage 1 to stage 4. These stages can be found by the process of ovarian cancer screening. For the treatment of this cancer there are several different methods available, including chemotherapy, biopsy and radiation therapy. Imaging tests: Ultrasound & CT scans. Blood test to help to detect the proteins found on surface of ovaries. Surgery to remove the cancerous tissue for further examination. The preventions of this cancer are as unclear as the causes are. However, there are some common prevention tips that can help reducing the risk of cancer. 72 out of 100, meaning, 72% of ovarian cancer patients have survival rate of 1 year after the diagnosis. 46% of women suffering from the disease have survival rate of 5 years. 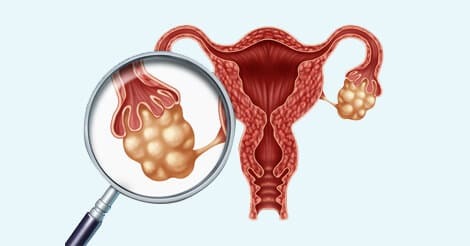 Ovarian cancer does not show any early symptoms and generally this cancer is detected much later when life-threatening cancer has spread through the ovary to other vital organs. Hence, it is important to have regular medical checkup to ensure you are healthy and fit. Trusted healthcare providers like Indus Health Plus offer a detailed analysis of the body which helps to maintain good health. To know more about the same, get in touch with us by filling the form given below.